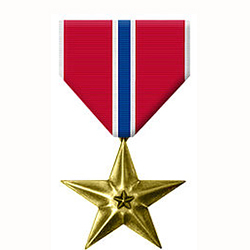 To justify this decoration, accomplishment or performance of duty above that normally expected, and sufficient to distinguish the individual among those performing comparable duties, is required, although less than the requirements for the Silver Star or the Legion of Merit. Minor acts of heroism in actual combat, single acts of merit or meritorious service in connection with military or naval operations my justify this award. The Combat Distinguishing Device may be authorized.